The next rung on the Harley ownership ladder is their midsize cruiser family – the Dynas and Softails – and this is where the biggest changes were made. With intense competition from other OEMs, Harley brought out the hot rod approach for 2016: stuff a big motor in it. Now, for the first time ever, customers can get the Dual Cam 110 Cu In. motor out of the touring family in the midsize bikes. These aren’t necessarily lithe, but the added shove makes passing on the highway easy. These new models are designated with an “S,” and the first ones are the Softail Slim S and Fat Boy S.
Compared to the last Softail we tested several years ago, the extra gumption was awesome to have in the higher altitude of Mt. Hood and behaving like a goon around town. The motor is not available in all trims, but if you want the most shove, step into the Softail Slim and Fat Boy S. The Softail Slim, in particular, is striking in Captain America-ish olive denim paint. The alpha stage of Harley ownership is the heavy-duty Touring and Bagger families. One of the most popular models, the Road Glide Ultra, hasn’t been available in the U.S., and as the bike of choice for Harley’s most loyal and mile-hungry contingent, this was a glaring omission. But the big boy is back for 2016. 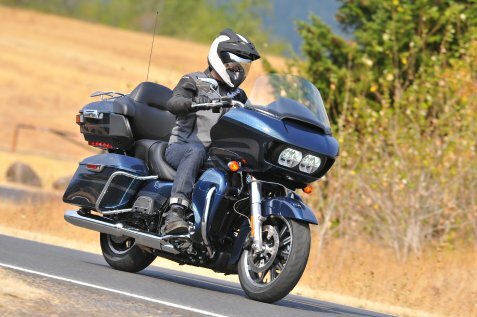 With a revised fairing, RUSHMORE water-cooled motor, and dripping in the new gadgets from the rest of the line, the Road Glide Ultra is a bruiser of a touring machine. Fans that have been holding out will be excited for this one. Wherever you find yourself in the Harley family, the raft of improvements has filled critical gaps in the lineup, improved areas that customers wanted, and made incremental improvements across the board for these models. Which one is your favorite?